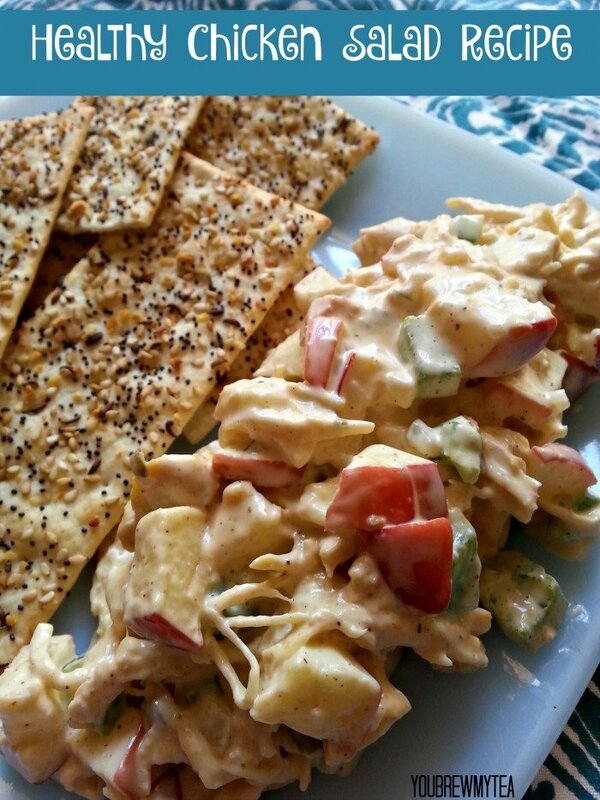 I am kind of addicted to this Healthy Chicken Salad Recipe. 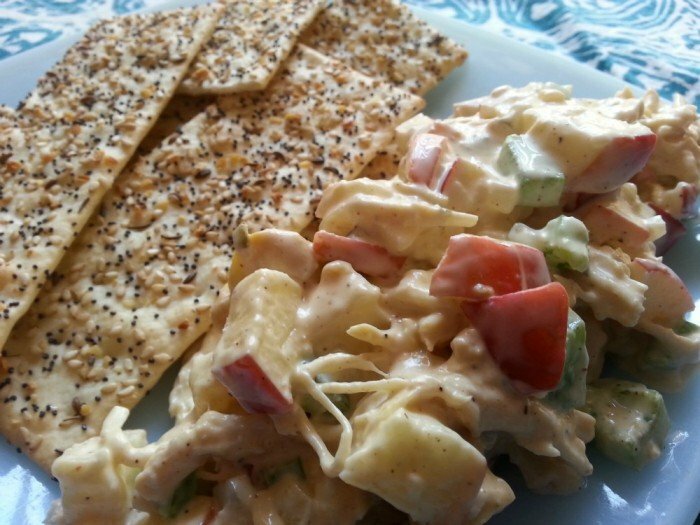 Chicken salad has always been a favorite of mine, but when I decided to eat healthier it was one of those things I figured I couldn’t have since it would be too full of fat with all the mayonnaise. This recipe has made it totally possible, delicious and a constant for lunches. Plus, needing to go low-carb, this is easy to eat on lettuce, alone or with just a few crackers instead of as a sandwich. This healthy chicken salad recipe is something you can whip up in just a few minutes if you already have chicken on hand. Since we tend to cook a lot of chicken, I almost always have some on hand in the refrigerator. If you don’t, you can either cook and shred some, or grab a rotisserie chicken at the grocery store for this recipe. I personally am hoping the man will get the hint and buy us a Ronco Rotisserie this year for Christmas. I’ve wanted one since I was 9 years old and saw my first infomercial. As often as I roast or bake chicken, it’s high time for me to buy one. 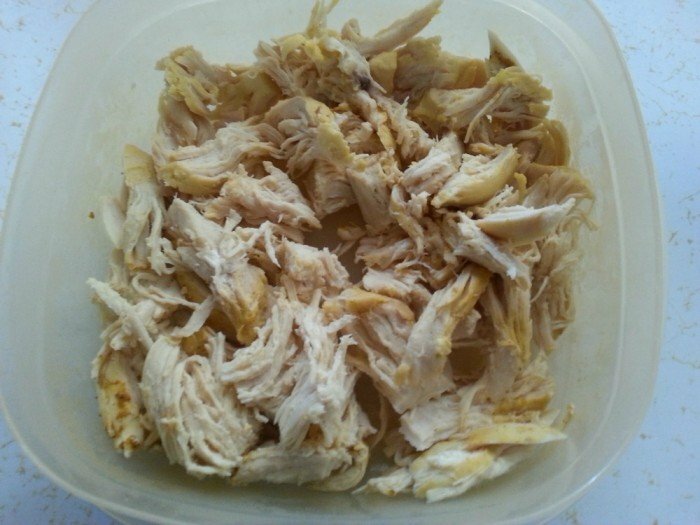 Shredded chicken is the base of this recipe. You can shred with a fork or by hand, yet a lot of people have begun sharing how easy it is to shred chicken using your stand mixer. I would definitely go that route if you have a lot of chicken to shred. The real key to making this delicious is using a combination of nonfat Greek yogurt, nonfat sour cream and just a hint of mayonnaise. I have tried routinely to cut out all mayonnaise, but it just didn’t work. Instead of using the complete amount, I can use just a teaspoon along with the other items to create a great creamy dressing. 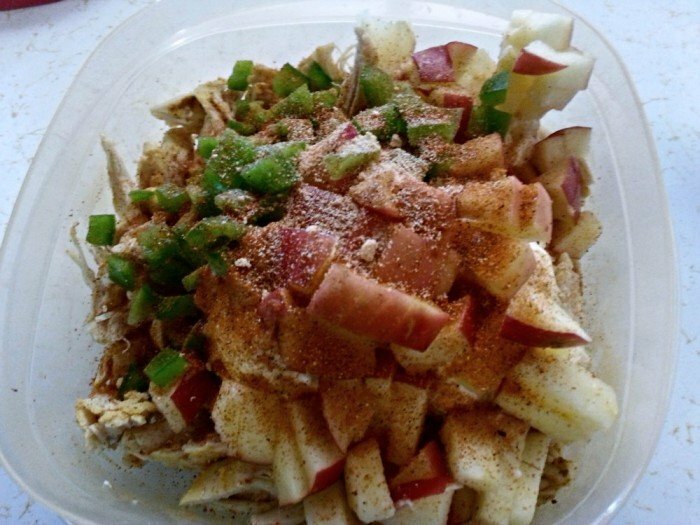 Now, when it comes to making a healthy chicken salad, I have had all kinds of items added to it. Nuts, fruit, vegetables can all go in yours. Our personal favorite combination is chopped Gala apple, bell pepper, and dill pickle relish. Fresh onion is good but is so hard to get right. Some onions are perfectly mild, while others are overpowering. For now, I add onion powder and skip the actual onion. Mix up this healthy chicken salad recipe and serve on lettuce, with crackers (we love these multi-seed flatbreads from Whole Foods), or a lower carbohydrate whole grain bread. You could even serve alone with a fork and a side of fresh vegetables like carrots, celery or cucumber. A friend suggested using celery like you would with ants on a log, and I think you could do the same with a cucumber. Check out some of our other favorite healthy lunch options! Yum, love chicken salad! Thanks for sharing at Merry Monday, hope to see you again next week!